I was prepared to be generous and give "Wives and Daughters" four stars for its sarcasm, deeply complex characters and many relevant themes. However there were small parts of the novel I did not like, and as the ending disappointed me gravely I ended on three stars instead. I adore Gaskell's biting sense of irony, and Clare Kirkpatrick is such a lovely and comical creation with all her notes of malice, ignorance and sheer stupidity. I was both disgusted and quite amused with the many (grim) aspects of her personality. Her daughter, Cynthia Kirkpatrick, is equally interesting as her character embodies a bit of tragedy as well a touch of unfortunate vanity. I had a hard time trying to figure her out, as she seemed highly complex at times. Cynthia even reminded me a bit of Dicken's Estella, as she too claimed she was too damaged to be able to love another person, because of her tragic upbringing. 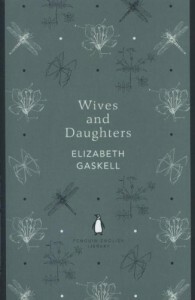 "Wives and Daughters" also contains some brilliant allusions to other well-known novels. I was so delighted when Molly's governess was identified as a certain "Miss Eyre". Gaskell won my heart with that reference. This novel also treats a great variety of themes, while painting a very vivid portrait of a small town and its diverse personalities. Birth and death, marriage and inconstancy, gossip and secrets, traditions and changes - the novel is very broad in its scope, almost like "Middlemarch", although not quite as ambitious. However I did not find Gaskell's language and writing style as rich as it was in "North and South". Perhaps "Wives and Daughters" has more irony and perhaps even a greater depth, but I did miss the long and pompous descriptions and the graceful flow of adjectives. I also thought the novel was rather slow-paced in the beginning - and almost too fast-paced at the end. It didn't feel very balanced or harmonious. And as I mentioned before, I did not like the ending. In general I don't mind an open ending, but this was too much. I felt cheated and unsatisfied as I really longed to see Molly get her happy ending. In fact, I almost yelled at the book. Of course, the story does end with a cheerful tone and the hope of a brightening future - but I was almost lead to believe there would be a dramatic declaration of love, sealed with a kiss.